He won't let anything hold him back. 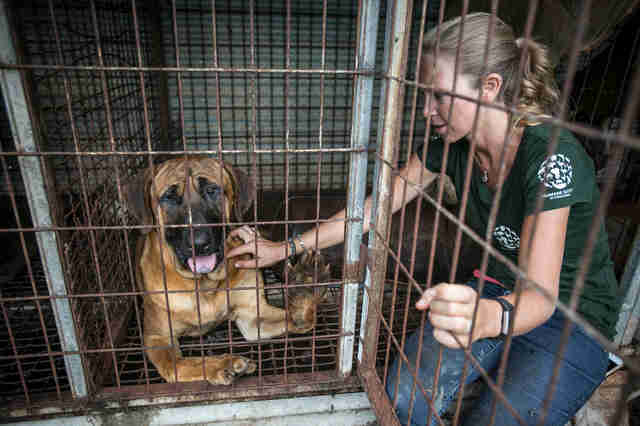 Kelly O’Meara’s heart went out to each and every dog she saw on the farm in Yesan, South Korea, where dogs were being raised and slaughtered for their meat. 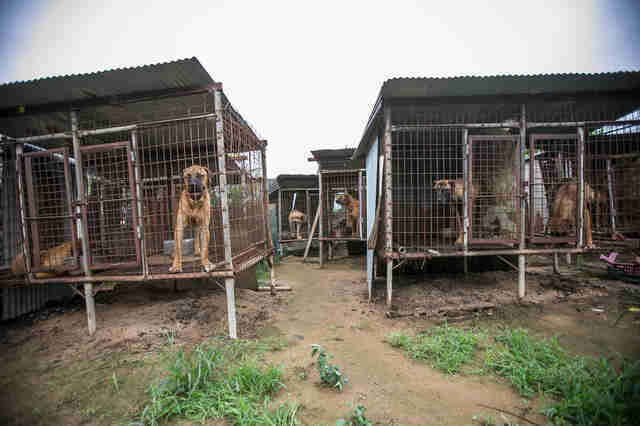 Since May, HSI has been communicating with the owner of this dog meat farm. He recently agreed to shut down the farm and never sell dog meat again, and in return, HSI will help him start a new career. 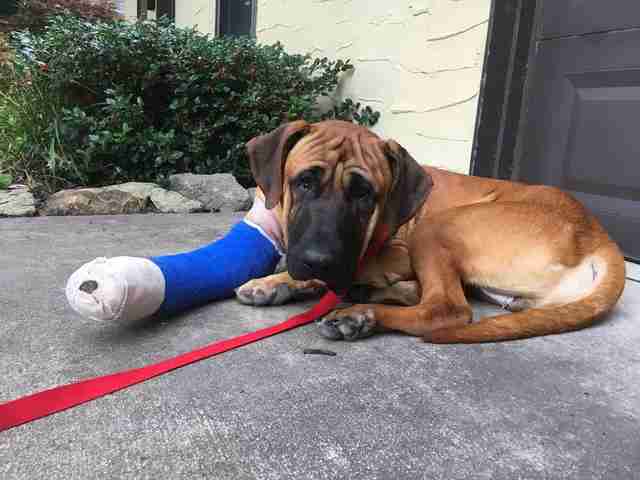 Last month, the dog meat farm finally closed down, and a rescue team from HSI arrived to move the 130 dogs, as well as two kittens, to the U.S.
One dog in particular caught O’Meara’s eye — a mastiff named Minsu with badly deformed front legs. 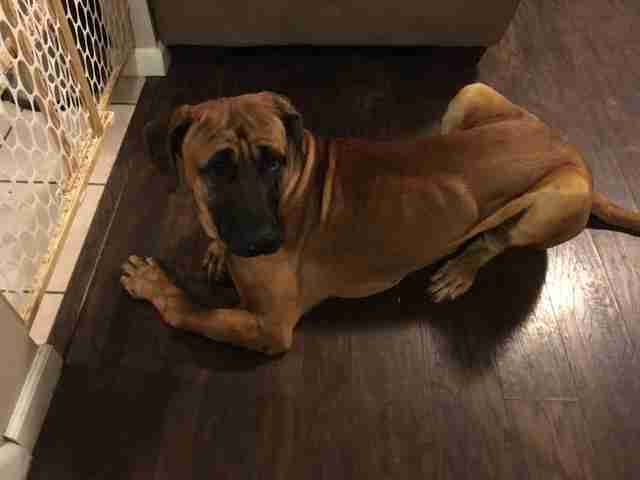 Minsu’s bent front legs are probably the result of a genetic defect, although O’Meara is sure the living conditions didn’t help. But once Minsu stepped out of the metal cage, his life changed forever. 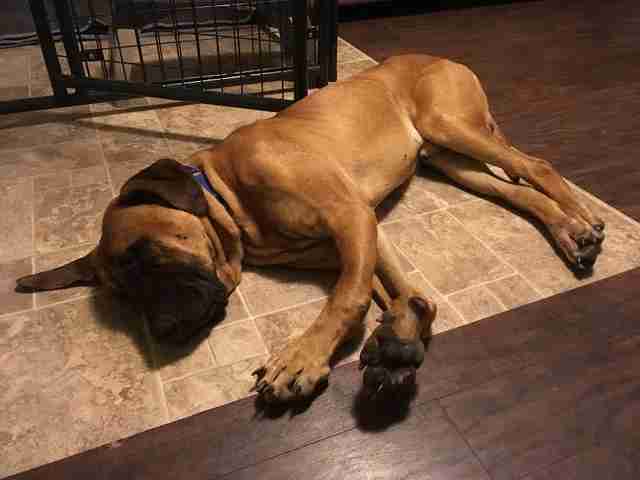 He was vaccinated and flown to the U.S., and he’s currently in foster care with Mastiffs to Mutts Rescue in Pennsylvania. Initially, Minsu found it difficult to adjust. Minsu also seemed terrified of blankets. “He would avoid the blanket — it was like he had a snake in his room with him,” Benoit said. 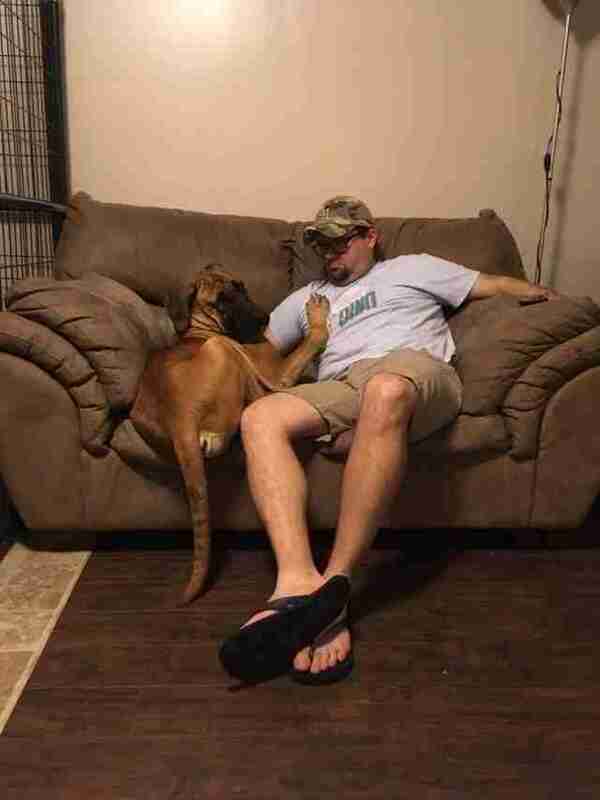 But when Minsu moved to another foster home, things started to look up — and he finally figured out how to sleep on a blanket. 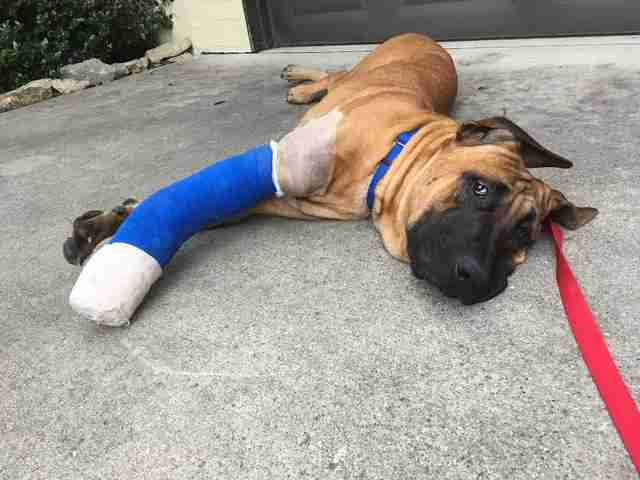 Minsu is also getting the surgery he needs to repair his deformed front legs. 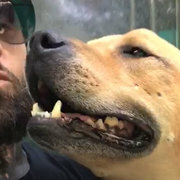 The vets will actually have to break the bones in his legs and reset them, and he will have a three-month rehabilitation process, Benoit explained. But Minsu isn’t letting his medical issues stop him from enjoying life. 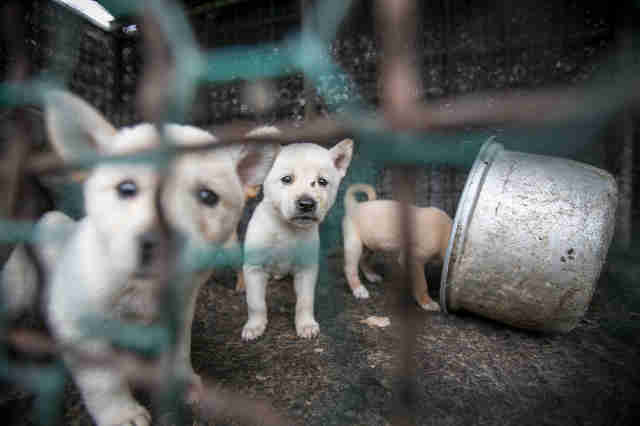 It’s estimated that 2.5 million dogs are slaughtered for their meat each year in South Korea. While dog meat is eaten year round, much of it is consumed during the “Bok Nal” festival that occurs each summer. 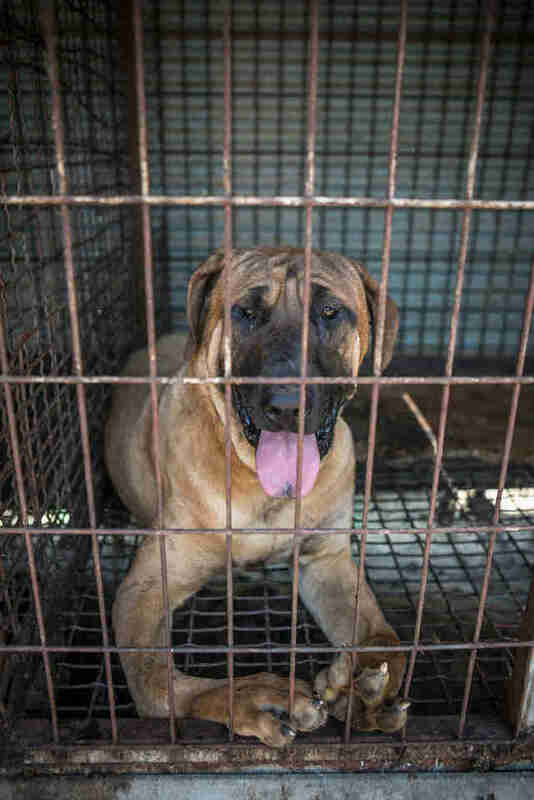 However, things may be getting better for dogs in South Korea — recently, South Korea’s newly elected president, Moon Jae-In, adopted a dog rescued from a meat farm, which has helped raise much-needed awareness about the dog meat industry. 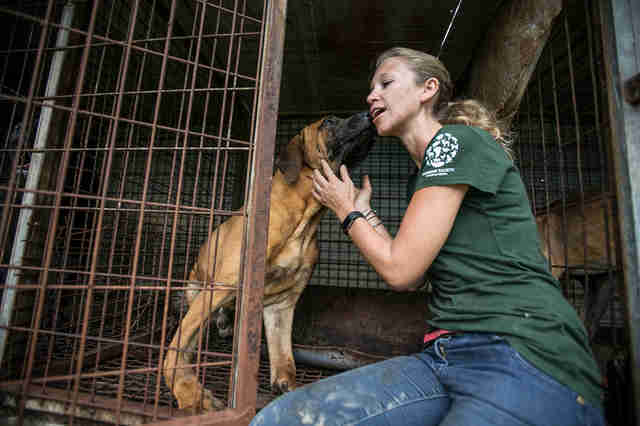 To help HSI rescue more dogs from meat farms in South Korea, you can make a donation.